Choosing a good daypack can be difficult, especially with all of the different features and specifications that come into play when you start shopping for them. But, one of the most important things that you will have to consider isn’t actually the features that you will need, but how long you will be out hiking for with that backpack. Will you be out for just a day, or will you be out for several or more weeks? In this article, we are going to cover how to choose the perfect daypack for a single day, or at most an overnight hike. 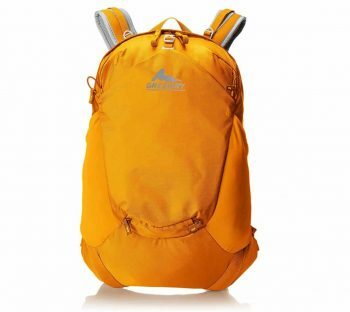 Now, if you were out hiking for several days, you would need a backpack with a capacity of around 70 L or more. However, if you are just hiking for a day then with some smart packing, you can usually get away with something around 25-35 L.
It should be noted that if you are travelling with children then you are probably going to need to take a larger backpack, especially if those children are quite young. There are several features that you should consider when you are looking into purchasing a daypack. Internal-frame backpacks are some of the most commonly purchased backpacks on the market, mostly due to their body-hugging internal frame. They have been specifically designed to help keep a hiker stable, rather than throwing them off balance. This means that an internal-frame backpack is perfect for rougher terrains, to aid your balance and help you avoid unnecessary injuries. An externally framed backpack is quite different, and it’s usually only an ideal option if you are packing in an irregular way. Or if you are packing a heavy load. One perfect example would be an inflatable kayak, putting it in an internal-frame backpack would result in something uncomfortable for you, whereas an externally framed backpack handles it perfectly. Externally framed backpacks also offer expert ventilation, helping to keep your back as cool as possible. Frameless backpacks are the perfect option for the speedy hiker, they have been designed to be as lightweight as possible. This allows people to hike faster, and pack lighter, but some additional planning is then required for packing. You can also purchase both internal-frame backpacks, and externally framed backpacks that feature removable frames. Most of the backpacks that you’ll see on the market (especially lighter backpacks for day hikes) will only feature a top loading option. This simply means that they only have the spot on the top of the backpack for accessing the main compartment. This isn’t a bad thing for day hiking, but it can make longer hikes difficult. If your daypack only features a top loading option, then you just have to remember to pack the things that you will need later in the day closer to the bottom. The idea of panel loading is quite different when compared to a pack that only features top loading. Have you ever had to rummage through the whole of your backpack for something that you packed too close to the bottom? We all have at one point of another. A panel loading feature literally means no more rummaging, you can unzip it and reach things that are closer to the bottom of your pack. This means that if your pesky compass has fallen down you don’t have to spend an hour unpacking and re-packing your backpack. Another thing that definitely needs to be taken into consideration is one of the most important features available to a hiker. The most desirable daypacks are all hydration-system compatible, although next to none actually come with the inserts that you will need! Most daypacks that you can find will be comfortable with a water bladder of between 1-3 L. If you don’t want to carry around numerous water bottles, then don’t miss out on this important feature. When it comes to keeping cool, water isn’t the only thing that you will need. You also need to make sure that your bag features a good ventilation system. Have you ever experienced a warm, and rather irritating back while you have been out hiking? A good ventilation system can be just the thing you need to avoid this problem. A lot of backpacks now feature a suspended mesh back panel; this helps to combat that extra heat that your back can experience. You definitely won’t experience a sweaty back if you take this into consideration. This is something that you need with most backpacks, but it is most important on externally framed backpacks. They’re usually designed in a way that keeps the actual backpack a few inches away from your back. How Should your Daypack Fit? Making sure that your daypack fits right is important, especially if it isn’t a sensation that you are used to. The first thing that you have to know is that your height doesn’t matter at all when it comes to picking the best daypack for hiking, it is your torso length that matters. This is most prominent on packs that have been designed specifically for women, as they actually feature a narrower design than the majority of daypacks. A well-fitted day pack will always feel as if it is snug against your hips. It has to be. This is because 80% or more of the weight that comes from your pack should be supported by your hips, rather than your back. If your back constantly held the weight from your pack then you would quickly find yourself experiencing symptoms such as back ache, and it could lead to back problems in the future. If you really aren’t sure that your pack fits you right, then try heading into your local ‘outdoors’ shop, they should be able to give you a good idea. Now that you know how to find the right backpack with features that could meet your needs, you are more than ready enough to shop for one. However, you’ll find that shopping for a daypack can be quite a daunting task. If you can be bothered to scour the marketplace or is simply open for recommendations, it’s highly recommended that you check out the products that we have highlighted below. Features: Hydration system compatible, easy adjustability, multiple different storage options, and reflective details for safety. Best use: Simple day hiking trips, or hiking trips with children. 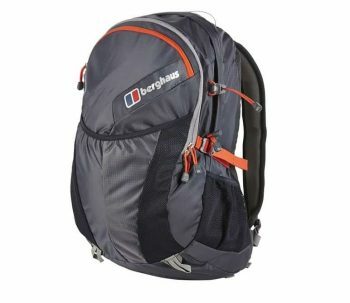 If you’re looking for a lightweight daypack, that is both comfortable and durable then the Berghaus Remote 25 Liter Rucksack might be the right option for you. It features a simple, easy to adjust design, opposed to numerous pockets and technical features. The storage system that it does offer include a zipped front pocket, as well as walking pole attachment spots and a front bungee. It’s a great option for simple, easy going day hikes. It’s just a solid pack that covers all grounds when it comes to a good hiking daypack. Features: Hydration system compatible, and made of polyester. Features both top and panel loading options for additional ease of use. Best use: Day hiking, or one-night camping trips. 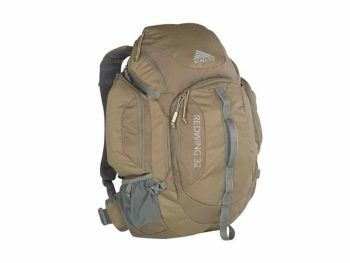 This backpack is a fantastic option for day hiking, mostly because of the loading options that it features. Most daypacks only feature a top loading option, whereas this hybrid features a top and a panel loading option. This means that if you do accidentally pack something too deep that you need earlier in the day, you don’t have to pull everything out to get to it. Kelty Redwing Backpack is also known for being a good option for people who have smaller frames, who would usually find a large backpack overwhelming. 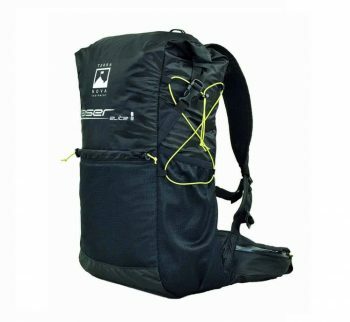 If you are planning a short hiking trip any time soon, you will want to check out this pack from Kelty. Features: Hydration system compatible, and made of nylon. Features a padded air-mesh back panel and has numerous different storage points. Best Uses: Day hiking, and hiking in bad weather conditions. The North Face are a company who pride themselves in creating equipment for the outdoors, and this is a great example of the things that they can produce. The North Face Recon Backpack features a padded air-mesh back panel, but it also has a spine channel and PE. All of these offers extra back support to the hiker wearing it, something that a lot of us need while hiking. Stylish, comfortable and packed with features, what more can you ask for? 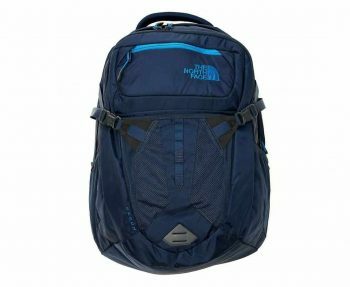 Related: The North Face also offer a 28 L daypack, The North Face Unisex Borealis Backpack. Features: Hydration system compatible, and made of nylon. Features a removable rain cover for bad weather and even has a trekking pole attachment. Best use: Day hiking, or hiking in bad conditions. When it comes to hiking in weather conditions that could be bad, finding a suitable backpack can be difficult. You need something with water resistant zips, as well as with a feature that keeps everything inside dry. Osprey Packs Stratos Backpack features a fully removable rain cover that deploys directly from the zippered bottom compartment, it guarantees to keep all of your important equipment nice and dry inside. It also has dual mesh woven side pockets, and zippered fabric pockets that have been placed directly onto the hip belt for easy access. 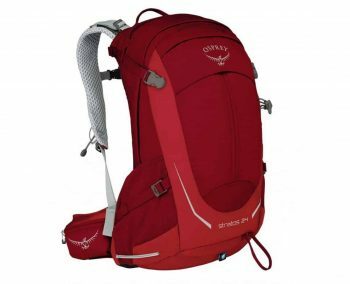 Related: For women with narrower figures, the Osprey Packs Women’s Sirrus 24 Backpack is another great option. Features: Hydration system compatible, and made of a synthetic material. Features airflow-mesh shoulder straps as well as an airflow-mesh back panel, and an adjustable sternum strap for comfort. Best use: This is a great daypack option for new hikers. The reason that this is a great option for new hikers is quite simple, it offers a generous amount of storage space. When you first start hiking you’re almost guaranteed to over pack, and preparing for that can be a good thing. 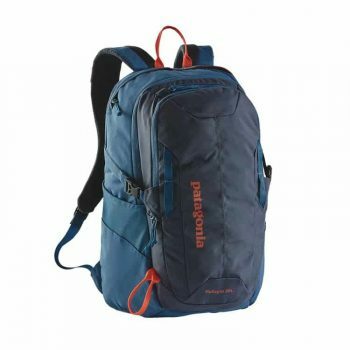 Patagonia Refugio Pack features both a main compartment and a secondary compartment. The secondary compartment has been designed with protecting electronic equipment in mind. It also features a few exterior vertical zippered stash pockets, and stretch woven pockets that are ideal for a water bottle. Features: Hydration system compatible, and made with extra padding, including padded shoulder straps. Features numerous attachment points as well as zippered storage pockets. Best use: Hiking and mountain marathons. Terra Nova are known for producing backpacks that are both comfortable and versatile, and the Terra Nova Laser Elite Backpack in particular has been designed for both hiking and mountain marathons. This means that it has to be sturdy, and it features padded shoulder straps so that you don’t end up with sore shoulders. There are also attachment points that have been placed directly on the shoulder straps. Features: Hydration system compatible, and made of nylon. Features one interior slip pocket and four external pockets, as well as additional padding. Best use: Day hikes and backpacks suitable for travelling. Gregory Mountain Products Z 25 Backpack has been designed with versatility in mind, to suit a wide range of requirements. It’s currently mostly used by both hikers and backpacking travellers, most of whom praise it for being comfortable. The back panel has excellent breathability, meaning that you won’t end up with a hot and sticky back if you wear this for too long. You should be aware that this pack is pretty tall, so if you’re not used to wearing tall packs it might take some getting used to. Features: Hydration system compatible, and made of ripstop nylon. Features a lightly padded back panel, which can be removed and used as a sit pad. It also has a sternum-strap buckle that doubles as a safety whistle. Best use: Hiking and a variety of other outdoor activities. When it comes to packs that feature a lot of technical specifications, the REI Co-op Flash 18 Pack could quite easily top the list. It has been designed by hikers, for hikers. It is both comfortable, durable and versatile. Both the shoulder straps and the back panel are lightly padded, and the back panel can be removed to use it as a sit pad. It features a sternum strap that doubles as a safety whistle, and a hip belt that can be detached. We know that not everyone likes to keep those fastened! 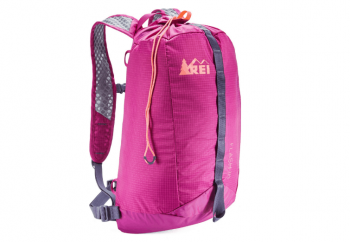 Related: REI also offer customers the slightly larger Trail 40 Pack, which is available in different colours for both women and men. So, when it comes to choosing a good daypack, just remember that features are important. It needs to be suitable for a hydration-system, but it also needs to be well ventilated. If you want to make things easier for yourself then go for a hybrid, that way you won’t have to dig around in your pack, even if you do lose something in the bottom of it. Remember that the way that you pack is important too, and make sure that you pack what you don’t need until later in the day to the bottom, and the things you need earlier to the top. All of those pockets can come in handy, you could put a sleeping bag in the bottom, or a snack/energy gel in one of the side pockets. No matter what, your daypack should be comfortable for you, with most of the weight going directly onto your hips, and not your back. So, choose your ideal daypack and head out hiking, the world has a lot to offer you. So, what do you look for when you are choosing a daypack? Or, do you prefer carrying a larger pack around with you at all times? Let us know in the comments below!